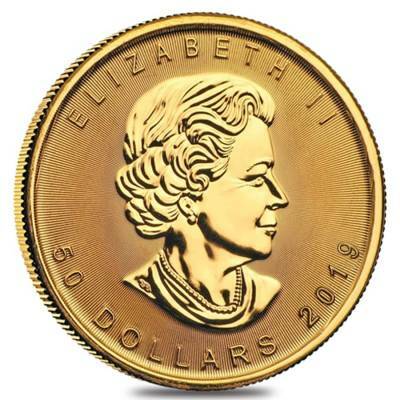 The Royal Canadian Mint introduces the 2019 1 oz Canadian Maple Leaf .999 Fine Gold $50 Coin in brilliant uncirculated condition. 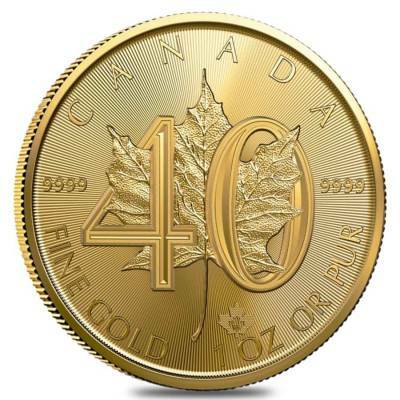 This exquisite coin celebrates the mint’s 40th anniversary and comes in brilliant uncirculated condition. The beautiful sugar maple leaf design with enhanced security features and her Majesty Queen Elizabeth II complete the look. The maple leaf is the national symbol of Canada. Additionally, this coin series continues to be one of the most popular among coin collectors and investors alike. The maple leaf is now laser-engraved to enhance security features. Inscriptions include “CANADA,” “9999 FINE GOLD,” and “1 OZ OR PUR.” This maple leaf is from the original design by Walter Ott. Inside the laser engraved maple leaf privy is a microscopic year of issue with the designs. The obverse showcases her majesty Queen Elizabeth II, a design by Susanna Blunt. You’ll read “ELIZABETH II,” “50 DOLLARS,” and “2019” on this side as well. Both sides of the coin also have radial lines for additional anti-counterfeiting security. Individual coins come in plastic flips. Multiples of 10 come in mint tubes. Obverse: Showcases her majesty Queen Elizabeth II, a design by Susanna Blunt. You’ll read “ELIZABETH II,” “50 DOLLARS,” and “2019” on this side as well. Both sides of the coin also have radial lines for additional anti-counterfeiting security. 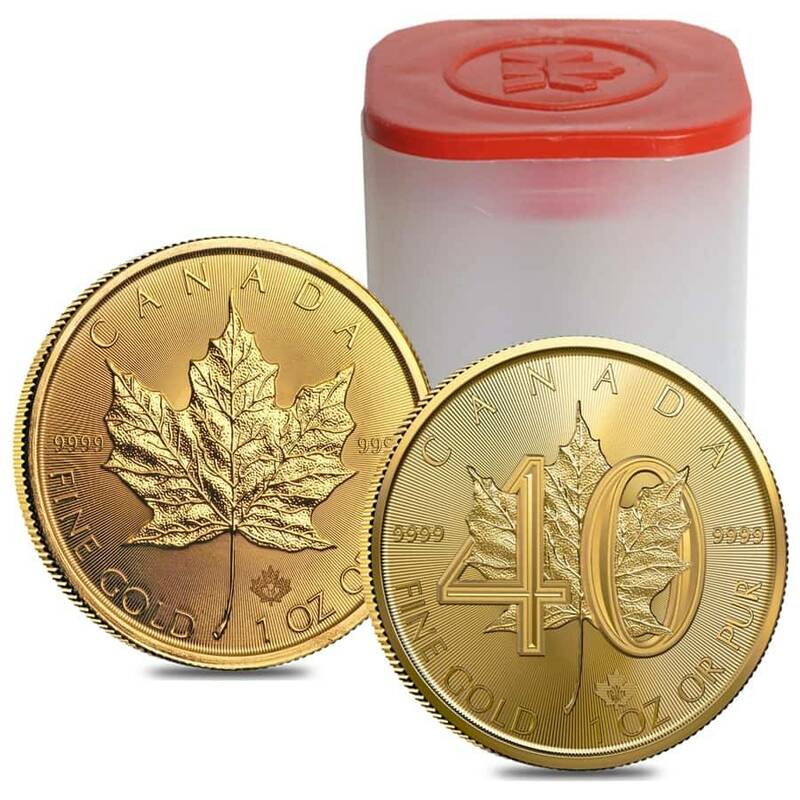 Reverse: Features the classic Maple Leaf design with the number 40 entwined with the detailed leaf. Inscriptions include “CANADA,” “9999 FINE GOLD,” and “1 OZ OR PUR.” Inside the laser engraved maple leaf privy is a microscopic year of issue with the designs. Don’t hesitate, order your exquisite 2019 1 oz Gold Canadian Maple Leaf 40th Anniversary Coin today. We will package and ship to you with the highest of care. If you have any questions, please reach out to us via our easy-to-use website chat or email, our customer service representatives will happily assist you. Another year another maple for me. BE always treats me with care and respect. 40th anniversary coin came in flawless, might be a 70. 1. Thank you so much to the Customer Service team for helping me during the check out process. 2. I was so happy to add this perfect coin to my Maple collection. 3. Shipping was so quick and secure. They take extra precautions when packaging the goods. BE is the best. absolutely stunned by this marvelous piece and so happy with the easy check out process. Cant wait to cash in my Bullionaire bucks in the next purchase! With this purchase, you earn 1348 Bullionaire Bucks 1348 BB = $1.35. We currently have 40 of this item in stock. For every $1 spend, you will earn 1 Bullionaire Buck which is equivalent to $0.001 off a future purchase. 1348 BB = $1.35.